As members of the weasel family (Mustelidae), Fishers and Mink have five toes on both front and back feet. Often all five digits do not register, but in prime tracking snow, you can sometimes see them. Typically, mink tracks are found near a body of water, and fisher tracks are found under a canopy, not in the open. Where you have both water and trees, it’s possible to see signs of both animals. In general, the larger the animal, the larger its tracks. Mink weigh one to three pounds; fishers four to eighteen pounds. In this photograph, the mink tracks (smaller, in the middle) are heading towards the top of the photograph, and the fisher tracks (top most and bottom most) are heading towards the bottom of the photograph. They were both traveling on a frozen woodland stream. If you take a walk along a small wooded stream that has many fallen trees along its banks, you can expect to find mink tracks somewhere along it. These wetland-loving weasels dig their dens in river banks, often under tree roots, and judging from their tracks, visit them frequently. It is not unusual for one mink to have several dens which it uses as resting spots along a stream. Mink spend a lot of time in the water hunting for fish, aquatic insects and crayfish. Mink are good swimmers and can dive as deep as 16 feet. 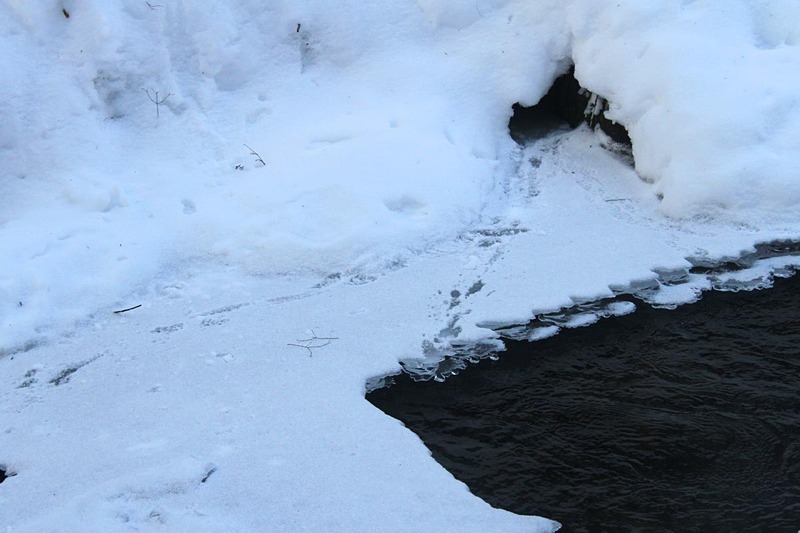 Tracks will run along the frozen sections of a stream, and then disappear into the water, only to reappear on the ice further downstream when the mink decides to travel on solid ground again. As members of the weasel family (Mustelidae), fishers and mink have five toes on both front and back feet. Often all five digits do not register, but in prime tracking snow, you can often see them. Typically, mink tracks are found near a body of water, and fisher tracks are found under a canopy, not in the open. Where you have both water and trees, it’s possible to see signs of both animals. In general, the larger the animal, the larger its tracks. In this photograph, the mink tracks (smaller, in the middle) are heading towards the top of the photograph, and the fisher tracks (top most and bottom most) are heading towards the bottom of the photograph. Although not pictured here, both of these carnivores engage in snow sliding, much like their cousin, the river otter, and the resulting grooves are occasionally found when the snow is a bit deeper than it is now.